If French is the language of love what about Turkish! To the Turks I believe it would be food. Food is thier way to express themselves to one and all, to thier children, to thier friends, to thier spouses and lovers. I would like to introduce a challenge from Very Good Recipes, Be My Valentine. Be creative and the best entry wins. Remember make them good as I will be one of the judges. I would like to thank Stepane for choosing me to be one of the judges. You have until February 27th to get your entries in. Here are the links to the rest of the judges blogs for the February challenge. 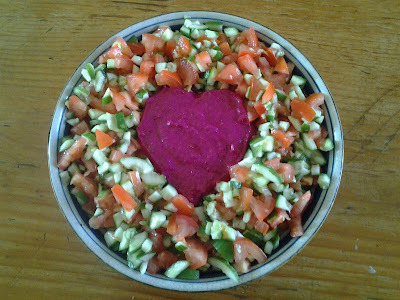 Since my Valentine is Turkish I thought I would make a dish that he would enjoy so that means Turkish Food. We will probably be having a glass or two of wine with dinner and what do Turks like with alcohol at a meal? Yes thats right Meze. I will be making Meze dishes for our special evening and this will be the feature. Yes this is a salad but the Turks love salads and my husband will love this. 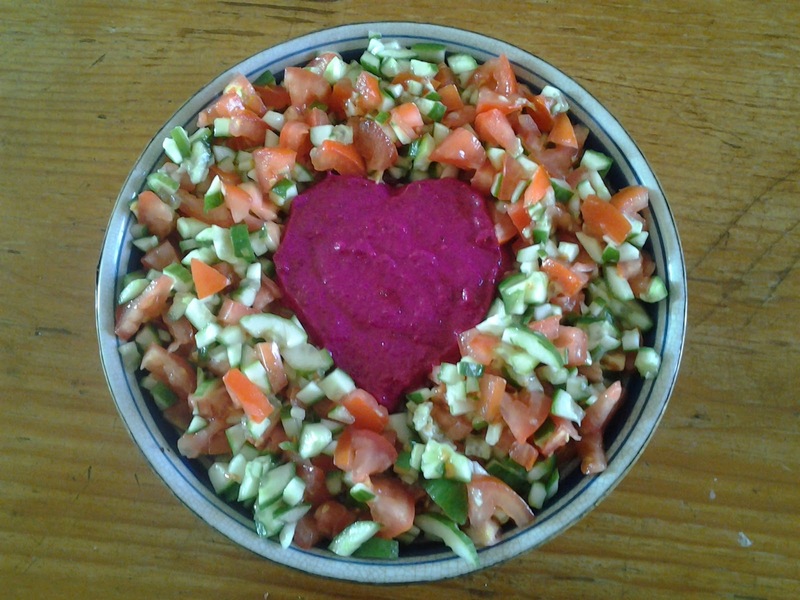 This is Pembe Sultan surounded with the classic Shephards Salad. So quick and easy to make. Mix everything together in a bowl then serve. Love it! And, reading your post reminded me that I forgot to put the strawberry graphic on my post! Love beetroot dip, littlej's favourite! This looks interesting and very inviting. Nice recipe! Thankyou to all the holiday accomodation sites hopefully you can try this with all your guests and they will love it. This does look very nice. I will definitely try this at home but i know that it is not an easy task to do! Good on you I think being from Cyprus will give you a bit of a headstart though as you know how it should all taste. What a lovely story, I hope hubby enjoys the dish with you for valentines day:) I am adding you to my blog list, I love Turkish food and your blog looks delicious!